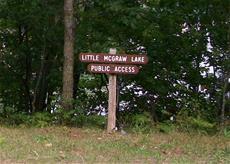 Little McGraw Lake Access is located at 3982 St. Croix Trail, three miles east of Hwy. 35 on the St. Croix Trail in Blaine Township. Limited to canoes and small boats.